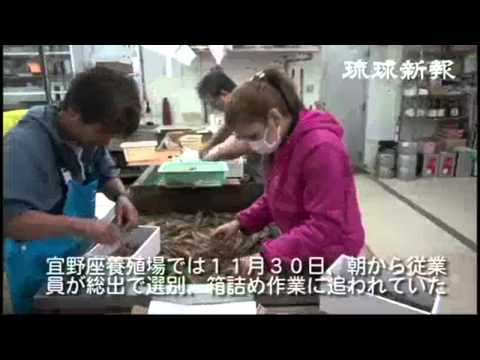 In the morning of November 30, workers at the Japanese tiger prawn farm in Ginoza packed live Japanese tiger prawns into boxes as o-seibo gifts. Into December, all over Okinawa shipment of Japanese tiger prawns, a popular gift during the o-seibo or gift-giving season in early winter, has started in full swing. On November 30, workers at the Japanese tiger prawn farm in Ginoza were busy sorting prawns caught from the sea in the early morning, and packing them into boxes full of sawdust. The farm ships around 45 tons of prawns per year during the period from October to June. It is reported that the amount shipped in December alone amounts to about eight tons because many people in other prefectures order prawns for the o-seibo season. The busy period peaks in the days to come.